The Process of Investigation. The Differences between the Public and Private Sector. The Fundamentals of Interviewing. 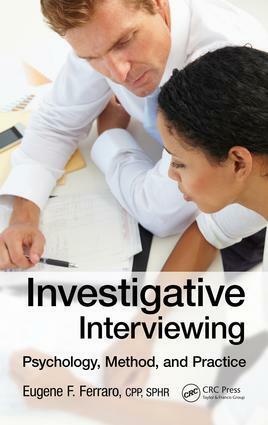 The Investigative Interview Method. Administrative Interviews and Communicating Our Results. Deception Detection and the Process of Overcoming Objections and Denials. Legal Challenges and Litigation Avoidance. The Future of Investigative Interviewing. Improving Results. Eugene F. Ferraro, CPP, CFE, PCI, SPHR, is currently the chief ethics officer of Convercent, Inc., Denver, Colorado. He has been involved in the study of organizational culture, workplace misconduct, and compliance for over 32 years. He is a prolific author and frequently speaks and trains on the topics of complex corporate investigations, culture management, and unethical behavior in the workplace. He is board certified in both Security Management and Human Resources Management (CPP and SPHR designations, respectively). He has been a member of ASIS (American Society for Information Science) International since 1987 and a commissioner on the ASIS Standards and Guidelines Commission. He is also a member of the Association of Certified Fraud Examiners and is a certified fraud examiner (CFE designation) as well as a professional certified investigator (PCI designation). Mr. Ferraro is a former military pilot, intelligence officer, and a graduate of the Naval Justice School. He is a frequent book critic for Security Management magazine and is the author of Investigations in the Workplace, 2nd ed. (Taylor & Francis Group, 2012), which is a textbook used by universities and other institutions of higher learning in the United States and abroad.